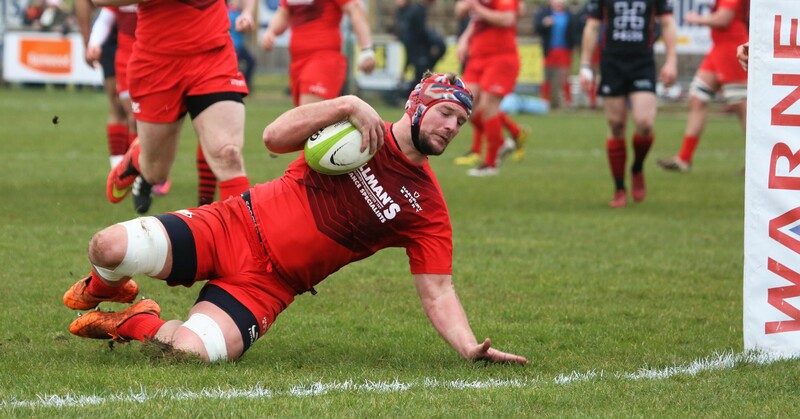 Hartpury collected another bonus point win, their 22nd in 23 unbeaten games since the start of the season, but there was little else to celebrate on a day when performance levels fell well below recent standards. Having wrapped up the win by early in the second half, the home team went on to produce a lacklustre final half hour in which Cambridge held the upper hand. While this result, allied to outcomes elsewhere, ensures that Hartpury remain overwhelming favourites to move up to the Championship next season, Saturday’s performance does raise questions regarding this team’s ability to operate at a higher level. Since mid-December, Plymouth, Esher, Fylde, Ampthill and now Cambridge have all claimed try scoring bonus points against a team who, despite retaining the best defensive record in the league, often look far from impregnable. Equally worrying on Saturday was that the home side also lost their way with the ball in hand, despite a first half display that produced six tries. Cambridge, meanwhile, deserve plenty of praise for their efforts. Although second best in many areas, their refusal to lie down and their willingness to challenge the Hartpury defence at every opportunity deserved more than the single point that they took from the match. Hartpury made some rotational changes with the giant Josh Ibuanokpe, Nathan Taylor and Des Merrey all coming into the front row. James Stephenson started at open side, although the backs were unchanged from last week’s good win at Ampthill. Indeed, there was very little indication of the struggles ahead as Hartpury raced to a 21-0 lead with only ten minutes on the clock. First, centre Steve Leonard carved a big whole through the heart of the Cambridge defence, before Jonas Mikalcius, tracking his run across the field, was on hand to open the scoring on his opposite wing. Three minutes later the men in red were back hammering at the Cambridge line following a typical Jake Polledri run. The ball was moved infield and a nicely timed pass found skipper Rhys Oakley bursting through to score near the posts (pictured). Polledri was credited with the third, getting the final touch to a powerful lineout drive. With Perry converting all three, Cambridge were already looking down both barrels. Had they buckled at that point, the game may well have followed a different course but, to their credit, they did not. With fly half Jack Green showing up well, they took advantage of some loose Hartpury play to work their way up field and got their reward when a looped pass found winger Mike Ayrton in acres of space to score. They grabbed another in the 19th minute when centre Albert Portsmouth latched on to a lazy Hartpury ball in midfield and had an unchallenged 40 metre run to the line. Stung, Hartpury collected themselves and produced another quick-fire three-try blitz. Ben Vellacott got the final touch at the back of another powerful driving maul before Polledri and mobile lock forward Joe Dancer combined to make big yards, eventually setting Levi Davis free to add to his growing tally for the season. Minutes later, Mike Wilcox made a huge break from deep in his own territory. Vellacott used his express pace to offer support and Steve Leonard applied the finish. Although Perry pulled his conversion wide, 40-12 should have been a handy half-time lead. As it was, there was time for Cambridge to respond, as missed tackles provided the opportunity for scrum half Tom Trotter to score. Hartpury started the second period brightly and, after Cambridge had done well to defend another driven lineout, there was no stopping Luke Eves as he bundled through tacklers to dot down. It seemed that the game would follow a similar pattern to the first half, with Hartpury largely dominant, but in fact, Eves’ effort was to be the last time that the home team threatened. Cambridge had nothing to lose and driven on by replacement scrum-half Stefan Liebenberg they had much the better of the remainder of the game. They secured a try bonus point through hard-working Number 8 Tom Nutley before two late scores ensured that they ended the game on a high. Shortly after a worrying incident in which referee Michael Hudson chose to ignore a clearly concussed and bleeding Hartpury player reeling around the pitch, at danger to himself and other players, a cross-field kick fell nicely for flanker Louis Rawlings. Cambridge then had the final word when, in the last play of the game, more poor defence allowed replacement Wade Schoeman to run in. Hartpury now get a week off before they face a challenging visit to Rosslyn Park. They will need to be much better than they were in this game to keep their unbeaten record intact. Hartpury: Wilcox, Davis (Try 32), Leonard (Try 37), Eves (Try 42), Mikalcius (Try 3), Perry (Cons 4, 7, 10, 25, 33), Vellacott (Try 25); Merrey, Taylor, Ibuanokpe, Batley, Dancer, Polledri (Try 9), Stephenson, Oakley (Try 7). Replacements: Flook, Brockett, Quinn, Chan, Shaw. Cambridge: Furbank, Hema, Portsmouth (Try 19), Ayrton J, Ayrton M (Try 14), Green (Cons 20, 40, 46), Trotter (Try 39); Seal, Griffith, Langley, Moon, Baxter, Rawlings (Try 73), Laxton, Nutley (Try 45). Replacements: Ruddock, Ibrahim, Schoeman (Try 79), Liebenberg, Petrides. The future is Cherry & White for for Jake Polledri! If green converted 4 tries Cambridge got 38 and a losing bonus point? Well spotted. Our mistake. The first try was unconverted. Now edited. Thanks. Like we said in our report, another point would have been no more than Cambridge deserved… Good luck for the rest of the season.